Moments before stealing the show at Sony’s press conference by announcing the Final Fantasy VII remake that may make it in time for the PS5, Square Enix whipped out World of Final Fantasy, a chibi-sprite game that promised to be “adorably familiar” and looked like something made for kids. On Monday night, most of us weren’t sure what to make of this Final Fantasy spinoff, which was announced for PS4 and Vita with a release window of “2016.” We had many questions. Is it free-to-play? Is it for children? Does it take after mobile games like Final Fantasy Record Keeper? Is it going to be worth our time? Just what is this game? During an interview at E3 in Los Angeles earlier this week, director Hiroki Chiba (who most recently worked on the very adult Final Fantasy Type-0) shared some details about this chibi game, which, as it turns out, isn’t just another Monster Hunter clone or children’s title. Chiba says it’s a genuine turn-based RPG, which may seem surprising to anyone who saw the trailer. But hey, this one might be worth a look for JRPG fans. 1) It’s got ATB-style combat. ATB, of course, stands for Active Time Battle, a staple of older Final Fantasy games (from IV to IX) that crosses menu-based combat with real-time turn gauges. “I’ve also changed it a little bit to add more of a [modern feeling] like current-generation games,” Chiba said, speaking through a translator. Your two main characters can also swap between big and small forms, which will affect their abilities both in combat and in the world. 2) The core gameplay will involve battling, collecting, and befriending monsters. Sort of like Pokémon with Final Fantasy creatures, which is a pretty compelling hook. Chiba wouldn’t go into detail on how this capturing system will work, but he did point out that you’ll be able to make your two main characters stack with monsters like behemoths and iron giants during combat. 3) This ain’t no free-to-play mobile game—we already know World of Final Fantasy is coming to PS4 and Vita, but Chiba says it’ll be a full-scale $60 game that takes advantage of both systems’ technical specs to get lots of monsters appearing on screen at once. 4) There’s an actual story. It involves two twins entering a world called Grimoire where all the Final Fantasy characters and monsters live. And Chiba says the plot won’t just be some rudimentary wrapper they slapped on to get you playing. “I personally worked on [Final Fantasys] VI, VII, and VIII so I’m trying to aim for that volume of a story that was in those titles,” Chiba said. 5) It’ll have all sorts of characters and settings from other FF games. The trailer, for example, shows Cloud (FFVII) and Cornelia Castle from the original Final Fantasy. Chiba says you’ll be able to interact with a ton of characters, and that many of them will have their own sidequests and plots to follow as you go through the game. 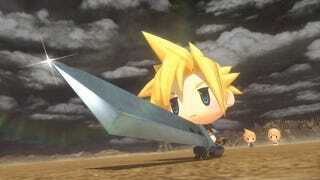 6) The chibi sprites are meant to appeal to non-Final Fantasy fans. In some ways, Chiba said, the goal of this game is to introduce a new generation of people to Final Fantasy, because today’s teens aren’t growing up with characters like Locke and Cecil anymore.